Last year my Valentine’s Day present was Alexandre Bilodeau’s Olympic gold medal. I was watching on a big screen in Robson Square, jumping up and down and screaming like crazy. Hugging the man next to me. Being interviewed by CTV but never actually being on TV. That sort of magic. This year my Valentine’s Day gift is a little more quotidian and a little closer to home (and my heart). I’m in love with my neighbourhood. I’m in love with East Vancouver. And it constantly, consistently, gives. No matter the weather, no matter my mood, my neighbourhood is friendly, beautiful, and vibrant. My inspiration to write this post and make East Van my Valentine is the “I Love You” graffiti that covers neglected surfaces in East Van (sources in Toronto report several “I Love You’s” spotted in that Canadian city as well). 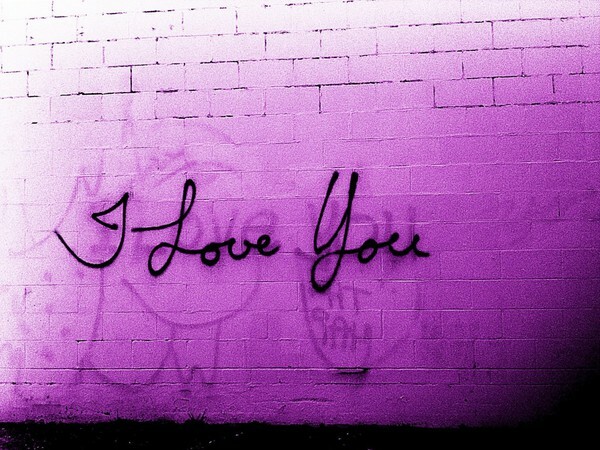 Every time someone paints over an “I Love You” it comes back. It’s vandalism, sure, but I do feel loved every time I see it. So thank you, East Van. Please be my Valentine and accept some possibly very bad poetry as a token of my love and esteem. Two outlaw artists spray paint the words “I Love You” on walls, fences, dumpsters. It is quickly, carefully, replaced. Outside a warehouse on Powell St.
Fall to the pavement on opposite sides of an empty parking lot. The Painters move slowly towards each other. Into something as solid and scary and gritty as a warehouse wall. –I’ve been leaving messages. Did you get them? –Yes. I answered. Did you see? Painter 2 does not move, only breathes. A touch that satisfies both. The gulls, with no sense of occasion, scream again. Two cans rust on opposite sides of an empty lot on Powell St. I pass them on the bus and close my eyes. Awesome. I was all mushy for east van while reading although i will leave the poetry for those it was meant. Those vandals who try to spread love no matter how many times they g painted over.